Couch potato looking for a new workout plan, but can't make it to the gym? You don't have to. In the privacy of your own living room during TV commercials, you can do it too. While watching TV, the amount of time you spend watching commercials can add up quickly. It is said that as much as 36 percent of the time spent watching you're your favorite prime-time TV show is made up of commercials. 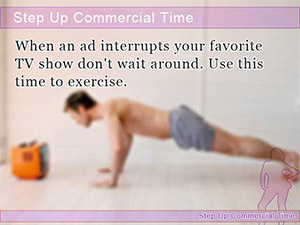 Although television commercial breaks only last 2-3 minutes, why not use that time doing something productive, like exercising? Let's take a look at how you can get an hour of exercise while watching TV. By putting in 2 minutes a day (during commercial breaks) this adds up to 14 minutes a week, which in a month adds up to 60 minutes, or one hour. If you are someone who watches TV every day, this diet may be right for you. For people who are too busy to go working out, exercising while watching TV is the answer. As they say, “many drops make a shower." With a little effort here and there, continued over time can yield big in your diets returns, helping you slim down while watching your favorite shows, and get off the couch during commercials. In order to get results such a short amount of time, we're going to have to break into some anaerobic exercise, bringing up the intensity a little. Anaerobic exercise allows you to train your muscles without high repetition, which is how you are going to give your metabolism a boost. After increasing your metabolism, it becomes easy to burn off energy even while sitting, making you less prone to gain weight. That is why we are going to strengthen our muscles to build a more fat-resistant body. Although you may have other idea regarding how you would like to spend your commercial break time, what we are going to be doing is effective and doesn't require any special equipment. So, you can forget about ordering that Ab-roller. You aren't going to need it. You may experience doing this exercise before. It's called a squat. Since it may have been a while since you learned it in PE, let's go over it one more time. For women, it's necessary to make sure that you are not turning your knees toward your inner thighs. 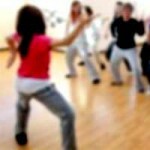 In addition, avoiding the use of momentum to get you though a squat is recommended, lowing and rising slowly, paying attention to form at all times. 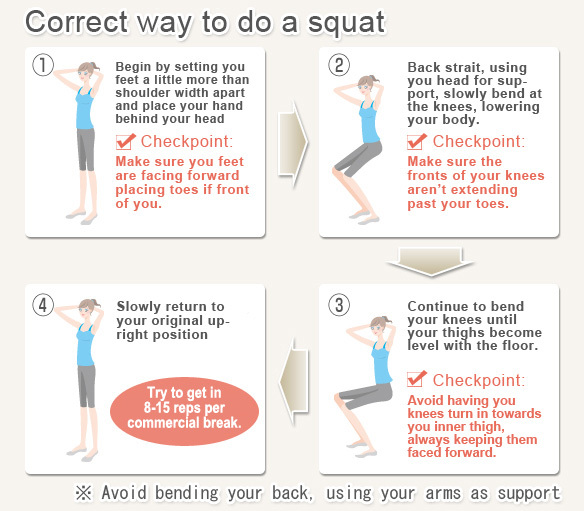 Although it is possible to do your squats all the way down, bending your knees until reaching a position where you feel like you are sitting; however because of the potential burden it has on your body, we will limit the bending of our knees while squatting to the point where the thighs become level with the floor. Squatting is known to be an effective training technique for both beginners and workout veterans alike. However, one thing remains constant, negligence of form. Even people that have been doing it for years are known to make mistakes. Are you paying attention to you form while squatting? Let's look the questions other people are asking. It's important to remember that squatting is not a race. As much as it feels like it is when trying to rise back to a standing position. It's important that until you get use to it, you should take your time and paying attention to your form, maintaining as much balance as possible. 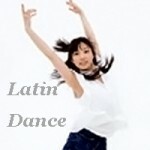 After you feel like you got it down, then should is it okay to start increasing the tempo. Take your time and smooth squatting. Is having your heels raise of the ground due to stiff ankles a bad thing? If you have stiff ankles, then you know that bending too much at your knees causes your heels to rise of the ground without thinking, forcing you to tiptoe. This is a problem many of us have to face. Neglecting problems associated with stiff ankles when squatting can potential damage your Achilles tendons, which why it is recommended that you don't overdo it, stopping before you start to tiptoe. Be safe and off your toes. Let's work on helping you slim down and shape up that tubby tummy that's been keeping you worried during the commercial break. “Oh no... Sit-ups!" you may be thinking warily. Sit-ups are not only prehistoric, but also a pain in the back. Don't worry, what we are going to be doing is easy as lifting you legs. That's right, leg-lifts. Not only can anyone do it, leg lifts do tons for your abdominal region and easy way to shape up your stomach without straining your back. Let's see how you can get started. Stick with 20 second intervals until you get use to the exercise! 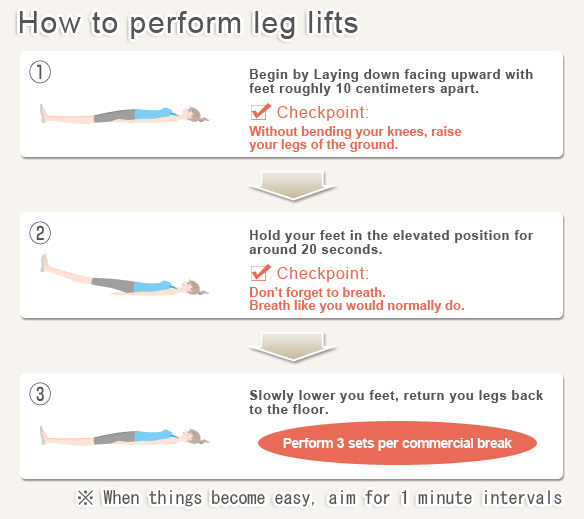 As easy as legs lifts sound, it may prove to be more difficult than you thought. When holding for 20 seconds feels like a burden, make adjustments starting with 10 second intervals instead. Pushing yourself too hard, overdoing it is only going to make it harder to keep up in the long run, diet failure. That is why in order to continue exercising, it is important to go at you own pace, being self-driven, building up confidence as you make exercise progress. The many benefits that come along with doing leg lifts! Although leg lift primarily focuses on working your rectus abdominal (six pack) muscles, it also has an effect of improving blood circulation, which helps prevent unwanted edema causing swelling in your legs. Less obvious, by preventing edema, performing leg lifts also help you fight off unattractive cellulite. When watching television the way you usually do, it is common to find yourself stuck in one position. This negatively affects your blood circulation. That is why using the short time you spend watching bothersome commercials exercising can help improve blood circulation and help you sleep better. When an ad interrupts your favorite TV show don't wait around. Use this time to exercise. The effort you put in and out of watching TV not only pays off where it counts but saves you time. Exercises that allow you to get a workout and enjoy watching your favorite shows at the same time.